CHAPTER 27 Financial Management in Not-for-Profit Businesses For-profit (investor-owned) vs. not-for-profit businesses Goals of the firm What are the key features of investor-owned firms? What are the key features ofinvestor-owned firms? 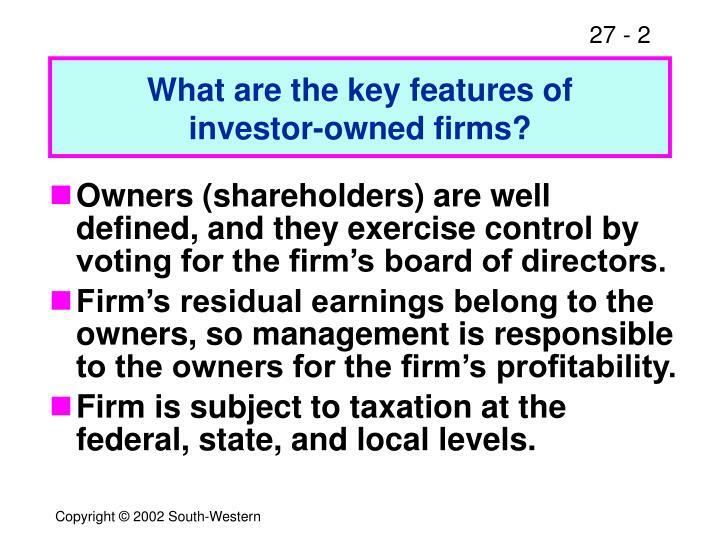 Owners (shareholders) are well defined, and they exercise control by voting for the firm’s board of directors. 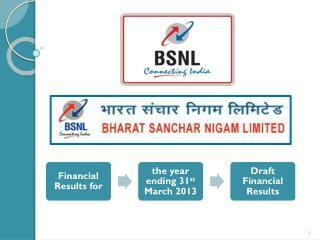 Firm’s residual earnings belong to the owners, so management is responsible to the owners for the firm’s profitability. Firm is subject to taxation at the federal, state, and local levels. One that is organized and operated solely for religious, charitable, scientific, public safety, literary, or educational purposes. Generally, qualify for tax-exempt status. 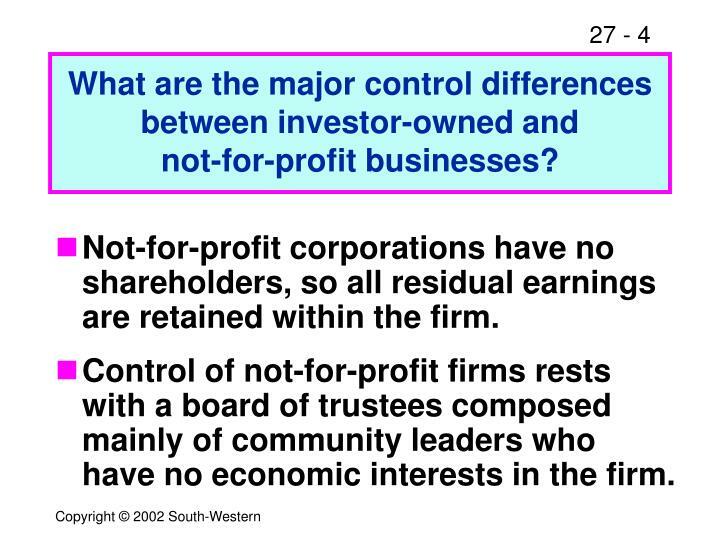 What are the major control differences between investor-owned andnot-for-profit businesses? 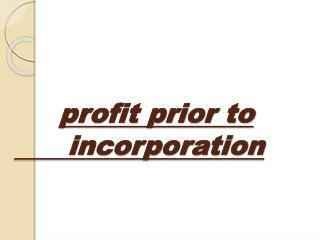 Not-for-profit corporations have no shareholders, so all residual earnings are retained within the firm. Control of not-for-profit firms rests with a board of trustees composed mainly of community leaders who have no economic interests in the firm. 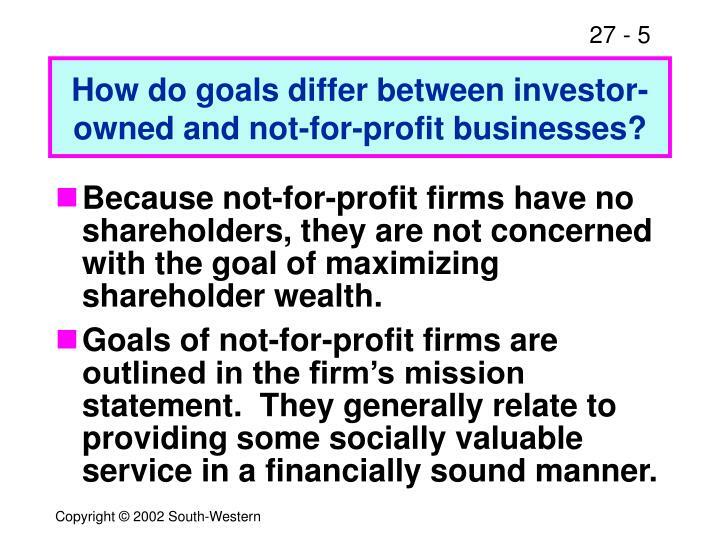 How do goals differ between investor-owned and not-for-profit businesses? 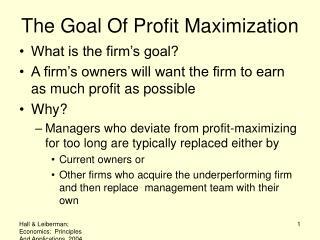 Because not-for-profit firms have no shareholders, they are not concerned with the goal of maximizing shareholder wealth. Goals of not-for-profit firms are outlined in the firm’s mission statement. They generally relate to providing some socially valuable service in a financially sound manner. 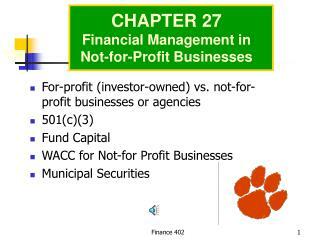 Is the WACC relevant to not-for-profit businesses? Yes. 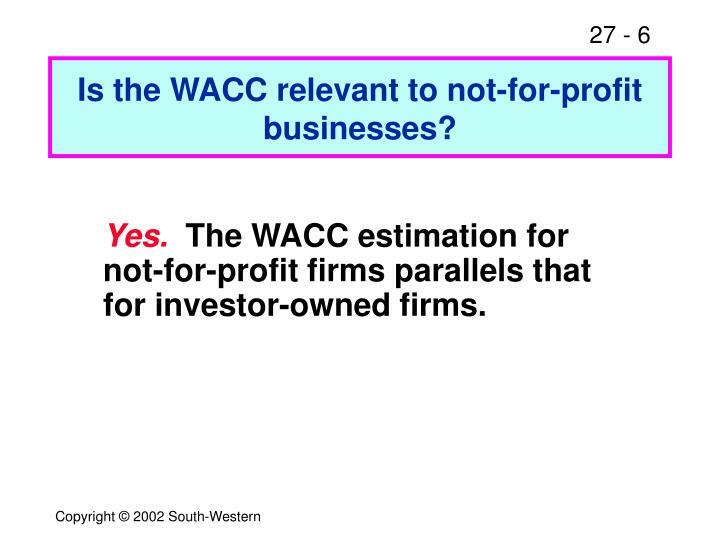 The WACC estimation for not-for-profit firms parallels that for investor-owned firms. 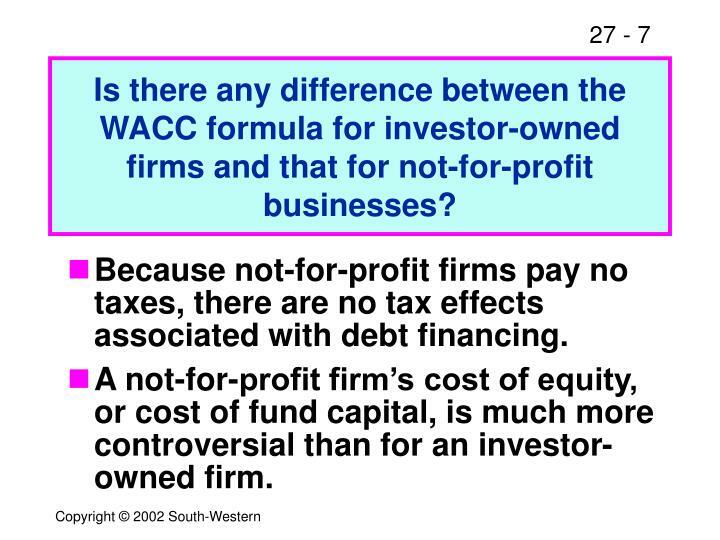 Is there any difference between the WACC formula for investor-owned firms and that for not-for-profit businesses? 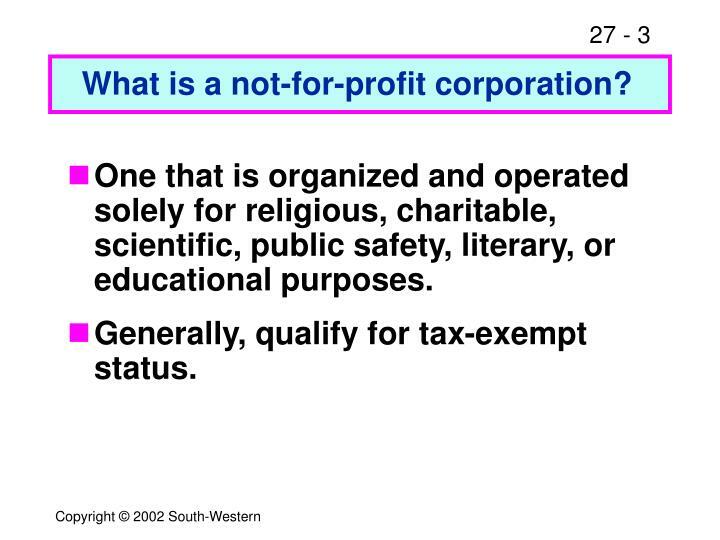 Because not-for-profit firms pay no taxes, there are no tax effects associated with debt financing. A not-for-profit firm’s cost of equity, or cost of fund capital, is much more controversial than for an investor-owned firm. 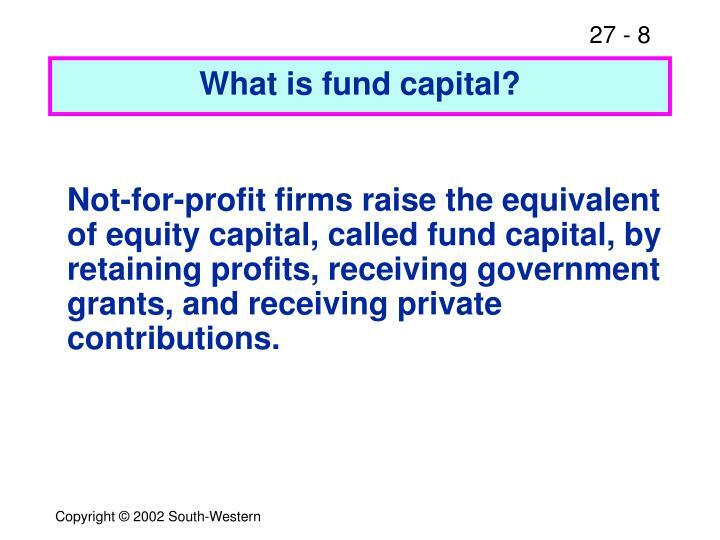 Not-for-profit firms raise the equivalent of equity capital, called fund capital, by retaining profits, receiving government grants, and receiving private contributions. How is the cost of fund capital estimated? 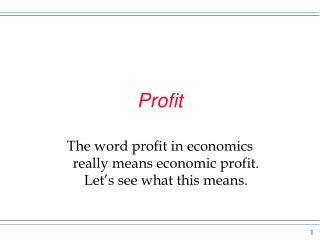 The cost of fund capital is an opportunity cost to the not-for-profit firm. 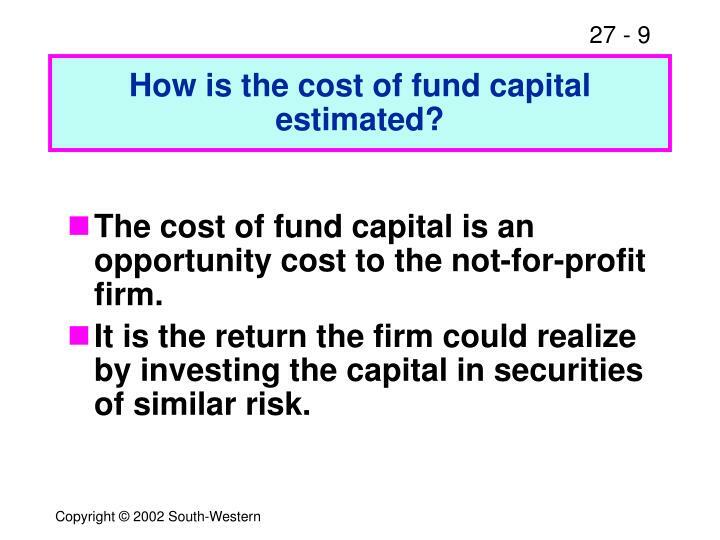 It is the return the firm could realize by investing the capital in securities of similar risk. 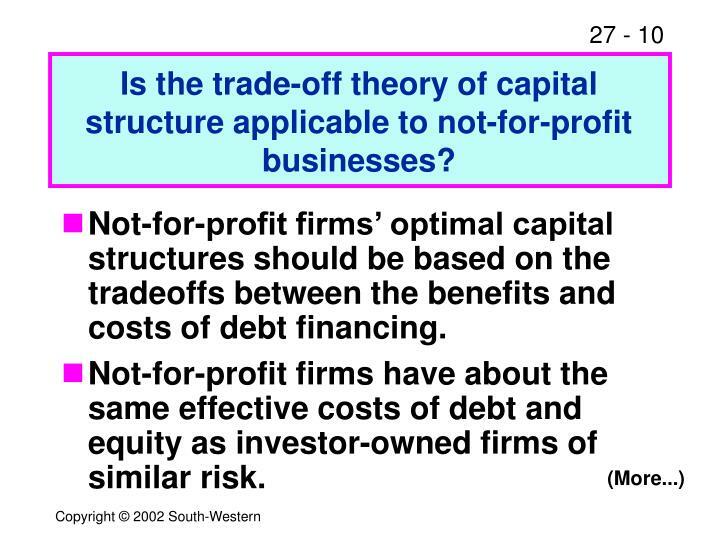 Is the trade-off theory of capital structure applicable to not-for-profit businesses? Not-for-profit firms’ optimal capital structures should be based on the tradeoffs between the benefits and costs of debt financing. 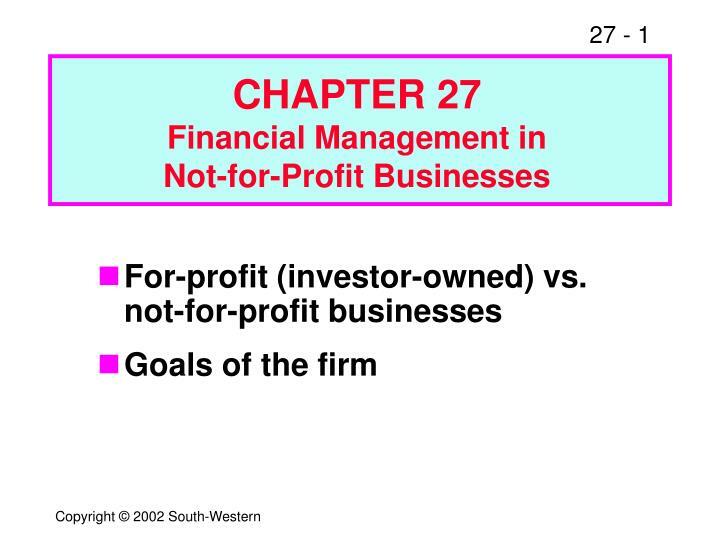 Not-for-profit firms have about the same effective costs of debt and equity as investor-owned firms of similar risk. 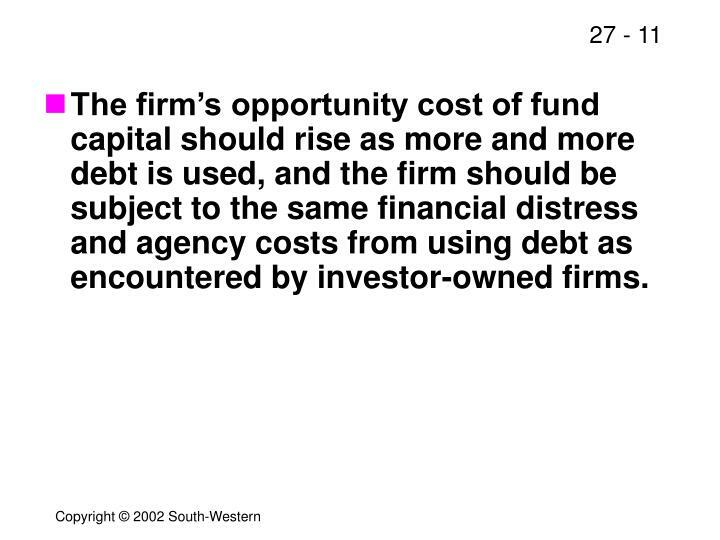 The firm’s opportunity cost of fund capital should rise as more and more debt is used, and the firm should be subject to the same financial distress and agency costs from using debt as encountered by investor-owned firms. Is the asymmetric information theory applicable to not-for-profit businesses? 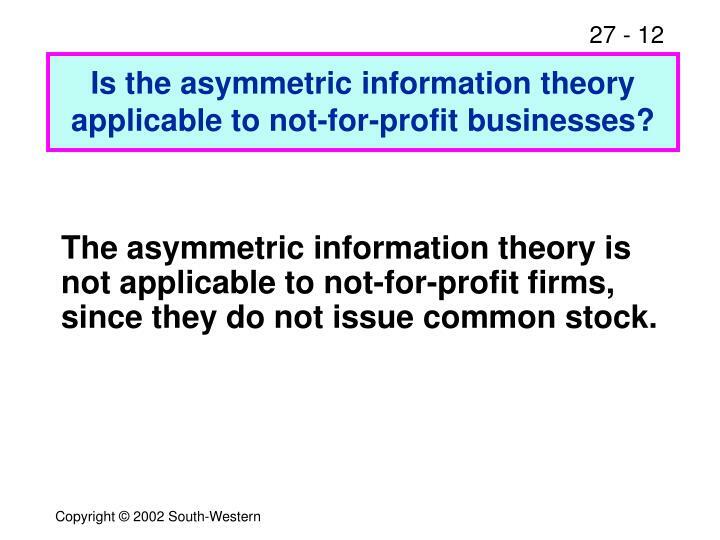 The asymmetric information theory is not applicable to not-for-profit firms, since they do not issue common stock. 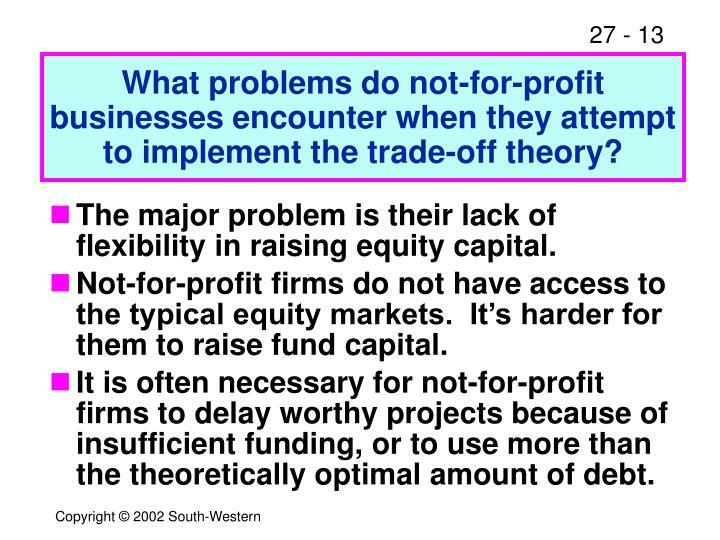 What problems do not-for-profit businesses encounter when they attempt to implement the trade-off theory? The major problem is their lack of flexibility in raising equity capital. 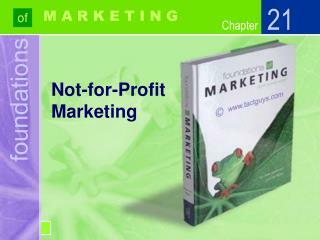 Not-for-profit firms do not have access to the typical equity markets. It’s harder for them to raise fund capital. It is often necessary for not-for-profit firms to delay worthy projects because of insufficient funding, or to use more than the theoretically optimal amount of debt. 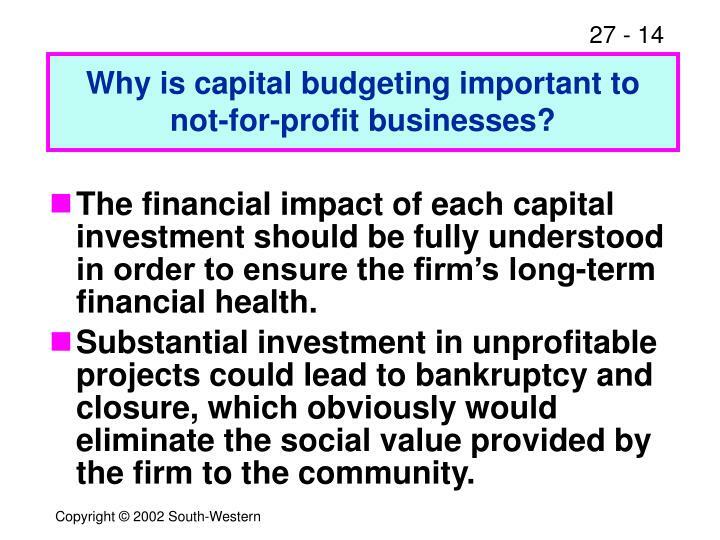 Why is capital budgeting important to not-for-profit businesses? The financial impact of each capital investment should be fully understood in order to ensure the firm’s long-term financial health. Substantial investment in unprofitable projects could lead to bankruptcy and closure, which obviously would eliminate the social value provided by the firm to the community. 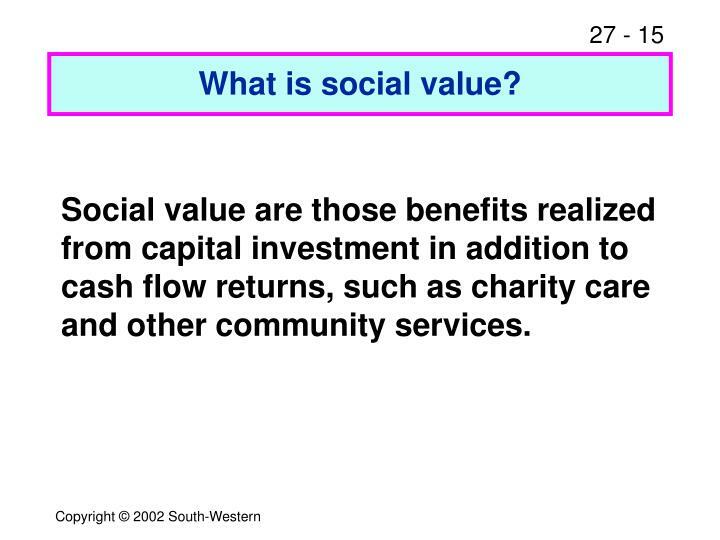 Social value are those benefits realized from capital investment in addition to cash flow returns, such as charity care and other community services. 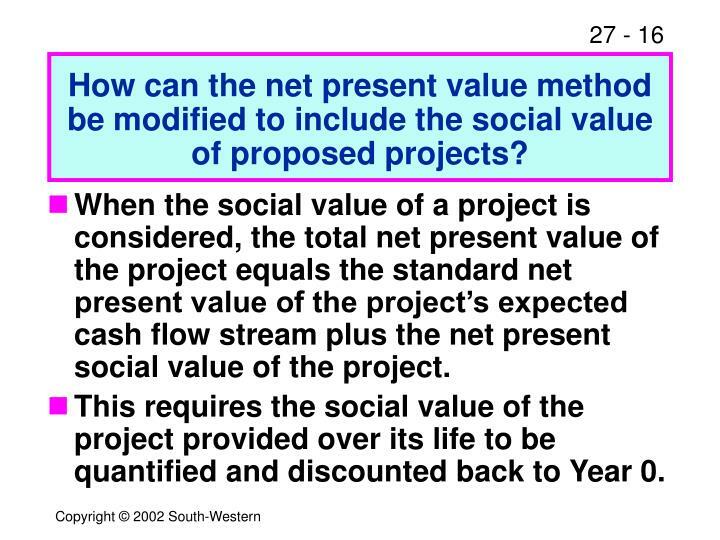 How can the net present value method be modified to include the social value of proposed projects? 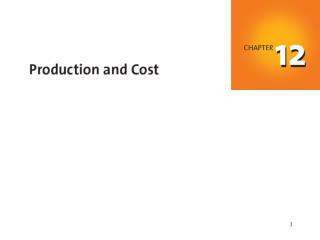 When the social value of a project is considered, the total net present value of the project equals the standard net present value of the project’s expected cash flow stream plus the net present social value of the project. 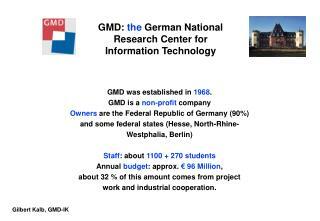 This requires the social value of the project provided over its life to be quantified and discounted back to Year 0. 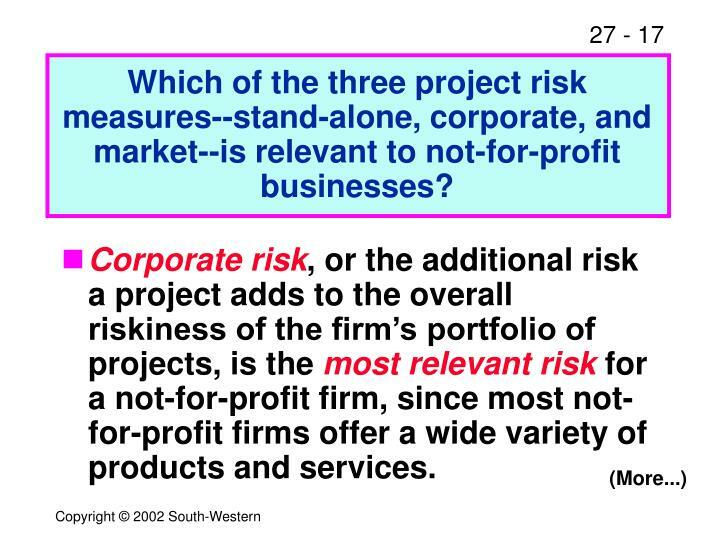 Which of the three project risk measures--stand-alone, corporate, and market--is relevant to not-for-profit businesses? Corporate risk, or the additional risk a project adds to the overall riskiness of the firm’s portfolio of projects, is the most relevant risk for a not-for-profit firm, since most not-for-profit firms offer a wide variety of products and services. 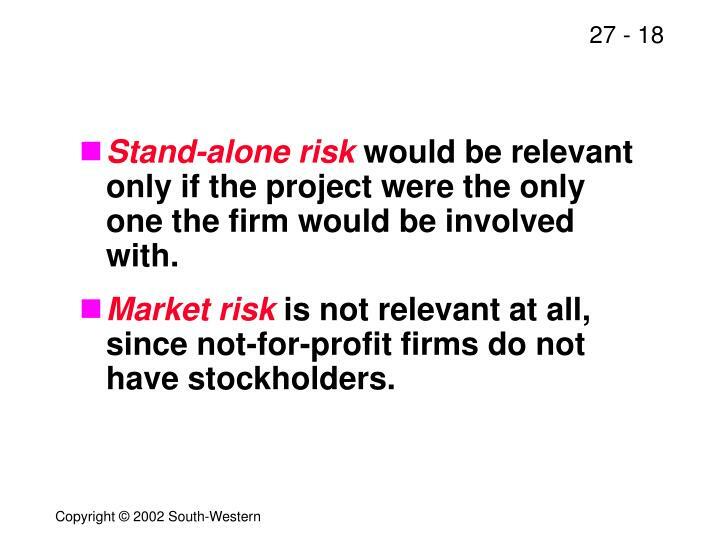 Stand-alone risk would be relevant only if the project were the only one the firm would be involved with. Market riskis not relevant at all, since not-for-profit firms do not have stockholders. 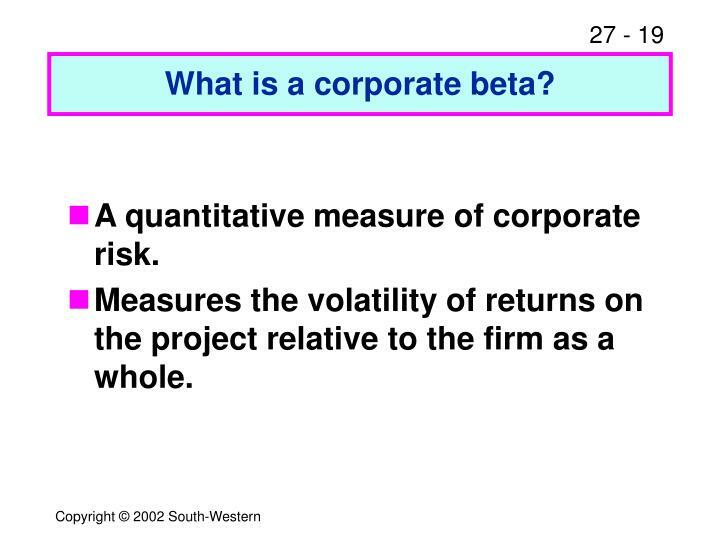 What is a corporate beta? A quantitative measure of corporate risk. 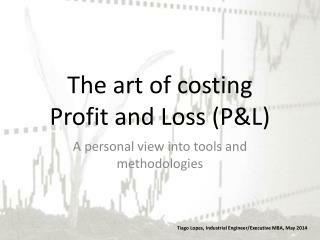 Measures the volatility of returns on the project relative to the firm as a whole. How does a corporate beta differ from a market beta? 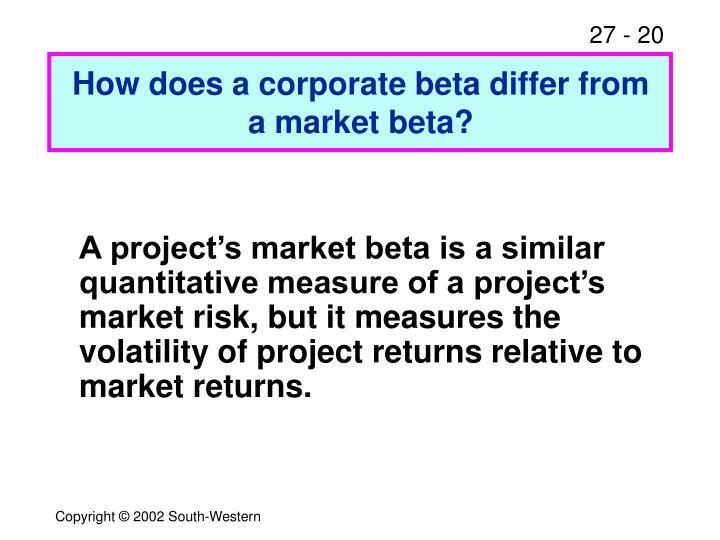 A project’s market beta is a similar quantitative measure of a project’s market risk, but it measures the volatility of project returns relative to market returns. 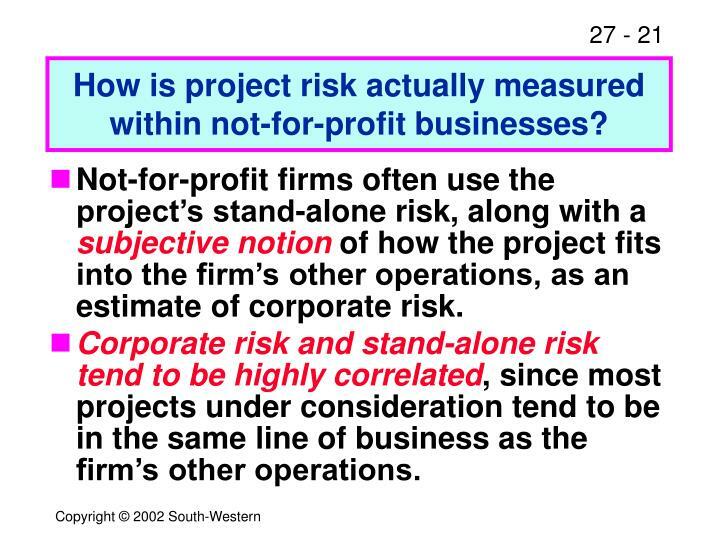 How is project risk actually measured within not-for-profit businesses? Not-for-profit firms often use the project’s stand-alone risk, along with a subjective notion of how the project fits into the firm’s other operations, as an estimate of corporate risk. Corporate risk and stand-alone risk tend to be highly correlated, since most projects under consideration tend to be in the same line of business as the firm’s other operations. 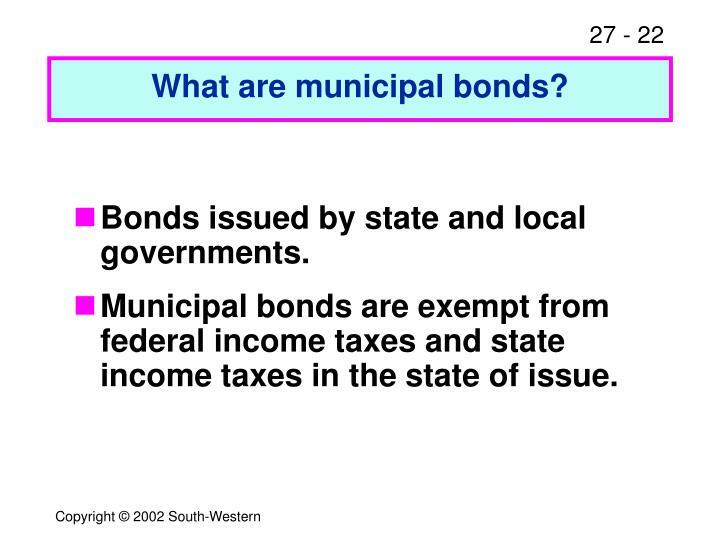 Bonds issued by state and local governments. Municipal bonds are exempt from federal income taxes and state income taxes in the state of issue. 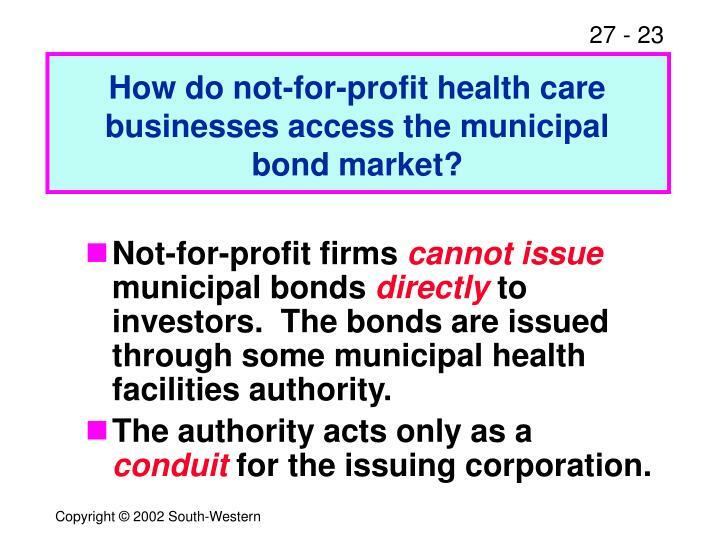 How do not-for-profit health care businesses access the municipalbond market? 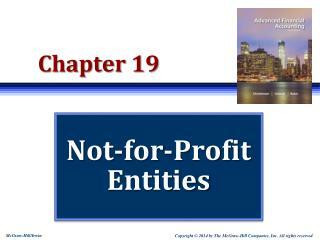 Not-for-profit firms cannot issue municipal bonds directly to investors. The bonds are issued through some municipal health facilities authority. The authority acts only as a conduit for the issuing corporation. 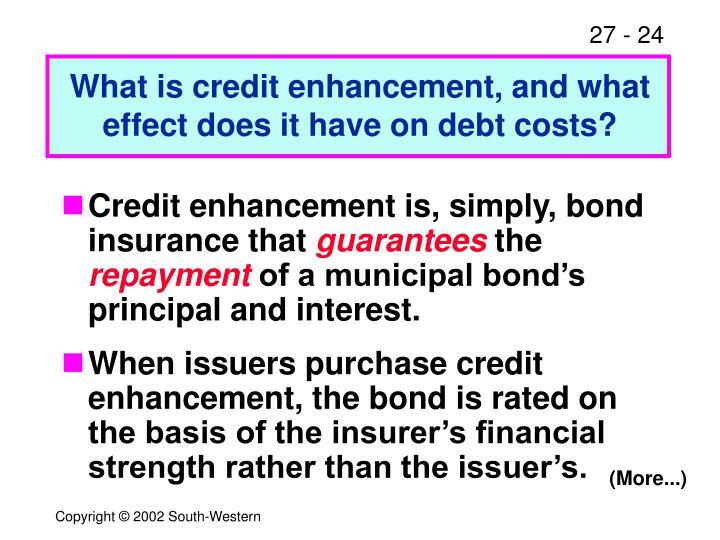 What is credit enhancement, and what effect does it have on debt costs? Credit enhancement is, simply, bond insurance that guarantees the repayment of a municipal bond’s principal and interest. When issuers purchase credit enhancement, the bond is rated on the basis of the insurer’s financial strength rather than the issuer’s. 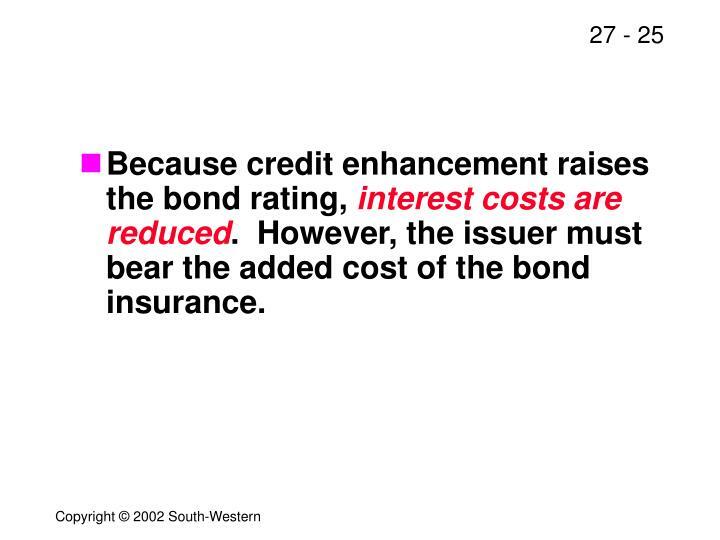 Because credit enhancement raises the bond rating, interest costs are reduced. However, the issuer must bear the added cost of the bond insurance. 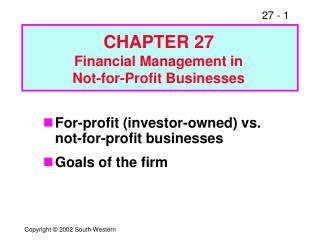 What are a not-for-profit business’s sources of fund capital? 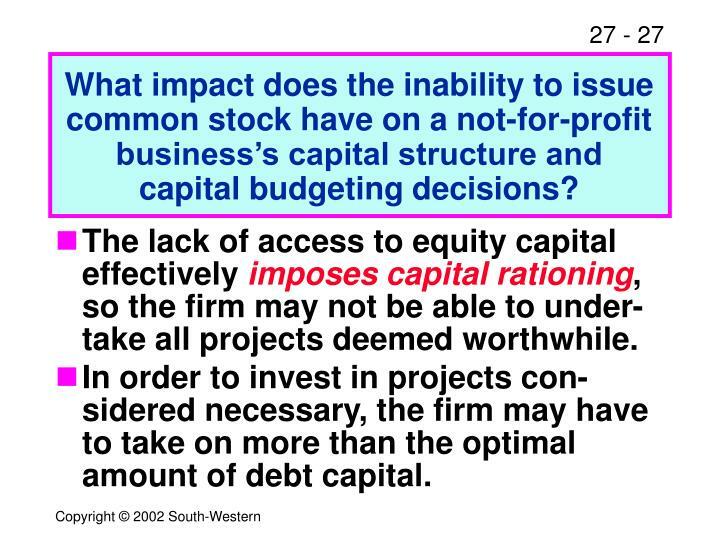 What impact does the inability to issue common stock have on a not-for-profit business’s capital structure and capital budgeting decisions? 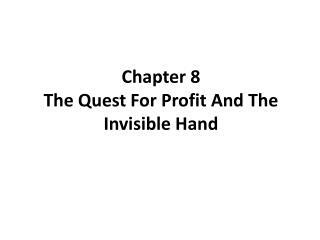 The lack of access to equity capital effectively imposes capital rationing, so the firm may not be able to under-take all projects deemed worthwhile. In order to invest in projects con-sidered necessary, the firm may have to take on more than the optimal amount of debt capital. 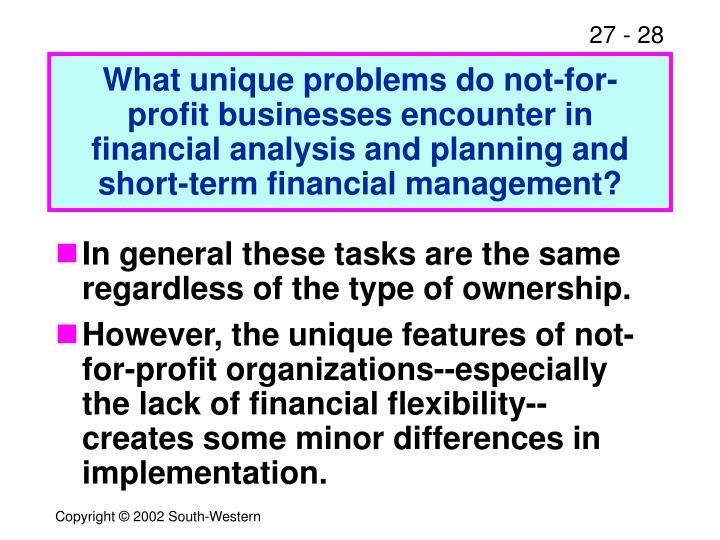 What unique problems do not-for-profit businesses encounter in financial analysis and planning and short-term financial management? In general these tasks are the same regardless of the type of ownership. 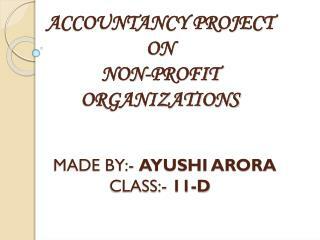 However, the unique features of not-for-profit organizations--especially the lack of financial flexibility--creates some minor differences in implementation. 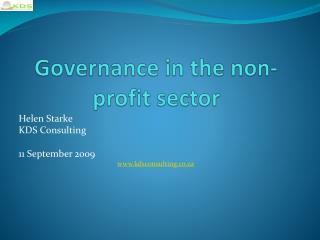 Governance in the non-profit sector -. helen starke kds consulting 11 september 2009 www.kdsconsulting.co.za. 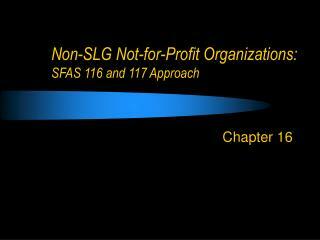 Essentials of Accounting for Governmental and Not-for-Profit Organizations -. 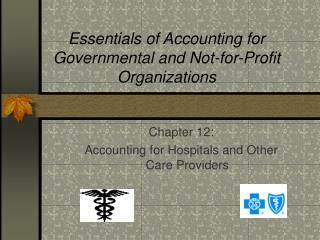 chapter 12: accounting for hospitals and other care providers. overview of chapter 12. who has standard setting authority? what types of entities are included?